White flowers recently seen in the greater Carderock area. 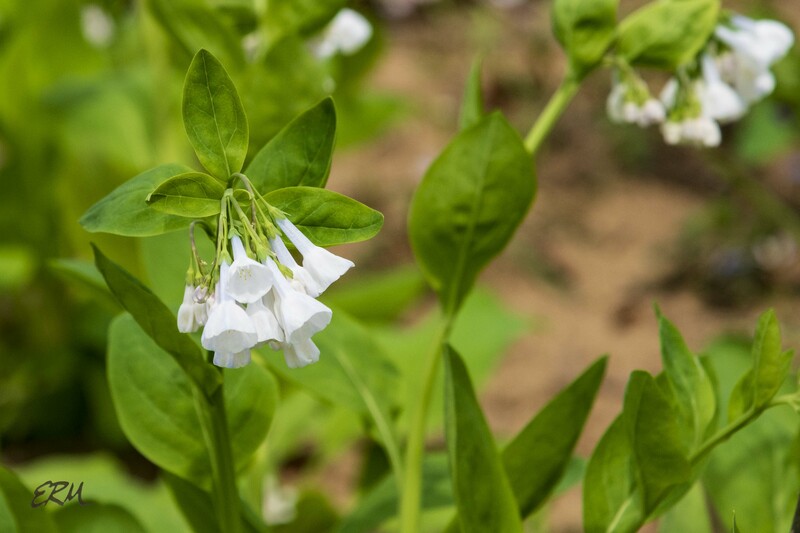 Virginia bluebells (Mertensia virginica; Boraginaceae) are of course normally blue, but every once in awhile you’ll see a stand of white ones. Look for them in floodplains and adjacent moist slopes. Look for twinleaf (Jeffersonia diphylla; Berberidaceae) on rocky slopes along Billy Goat B; it will likely be done blooming by tomorrow. 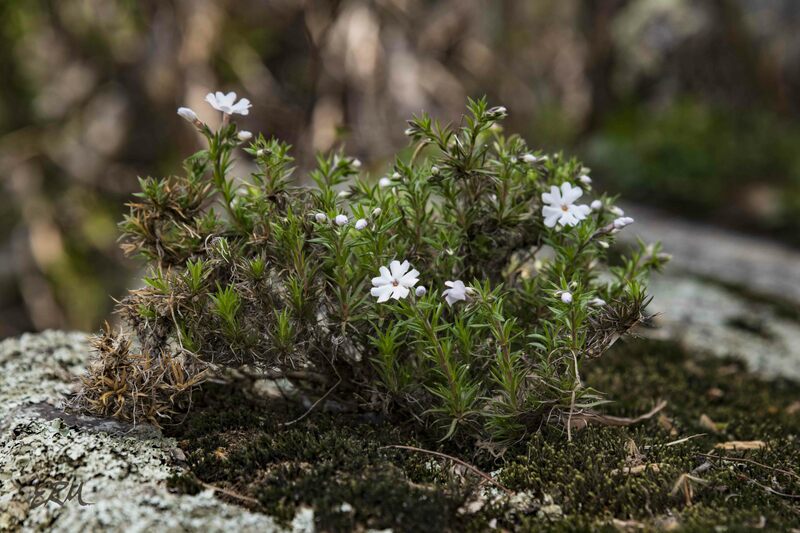 Moss phlox (Phlox subulata; Polemoniaceae) should be blooming for at least another month. As you can see from the photo, it doesn’t need much soil. Look for in on large rock formations along the Potomac River. 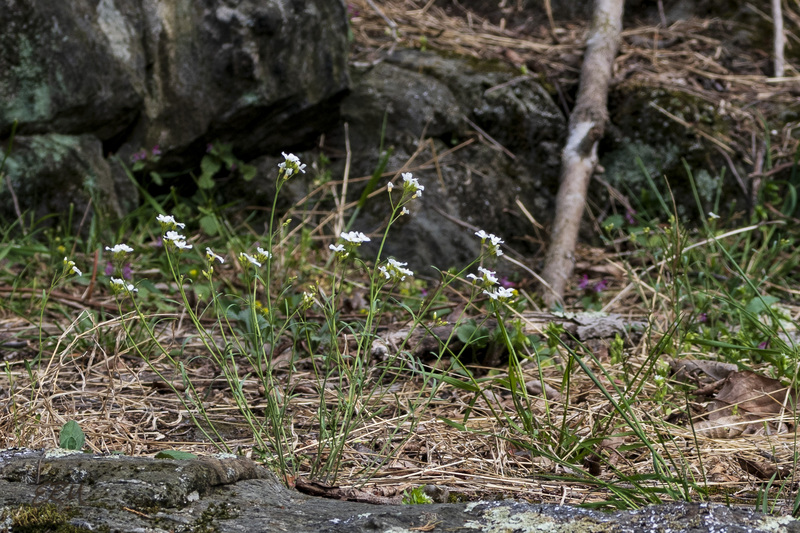 Lyre-leaved rockcress (Arabidopsis lyrata; Brassicaceae) is another rock-loving species. They’re so wispy they can be hard to see, but should be blooming for at least another month. Bloodroot (Sanguinaria canadensis; Papaveraceae) is almost done blooming. You can find it in rich woodlands, usually in colonies. 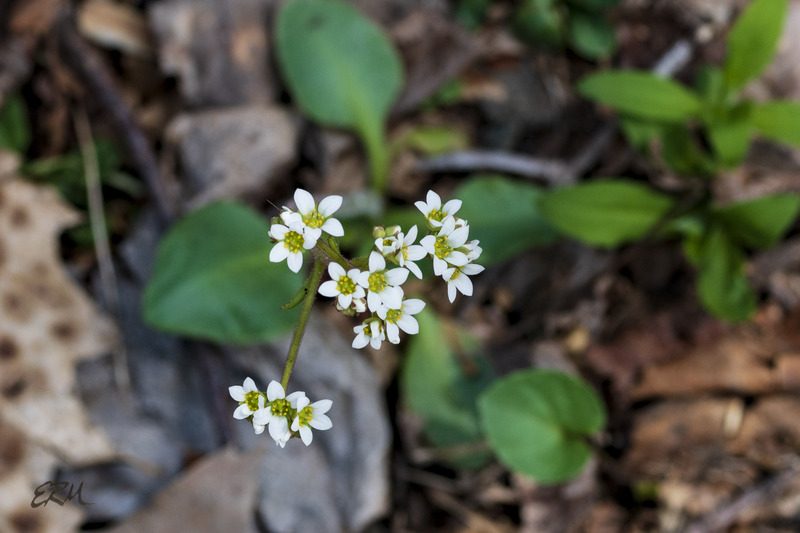 Early saxifrage (Micranthes virginiensis; Saxifragaceae) grows in thin soils in rocky woodlands. It’s one of the earliest bloomers but lasts for a fairly long time. 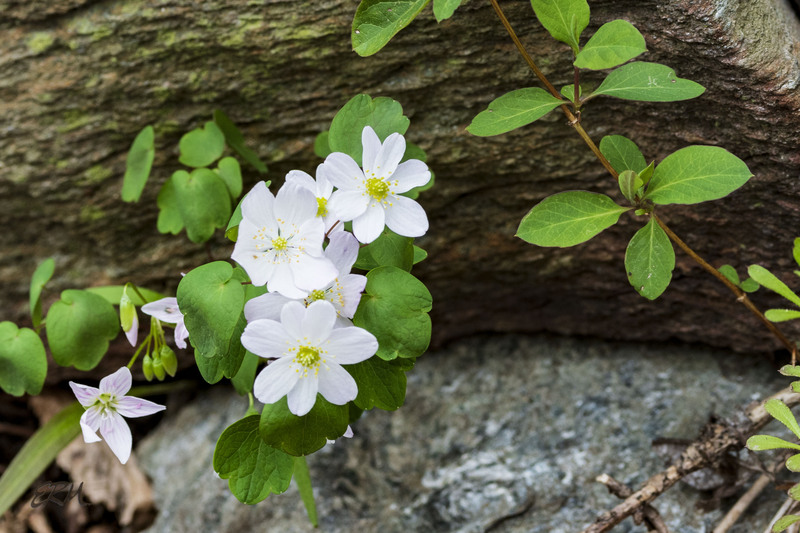 Rue anemone (Thalictrum thalictroides; Ranunculaceae) is just starting to bloom. It’s common in the Maryland piedmont but for some reason there isn’t much of it in the Potomac gorge. Look for it in the very open wooded areas near the Marsden Tract. It should bloom for another month. 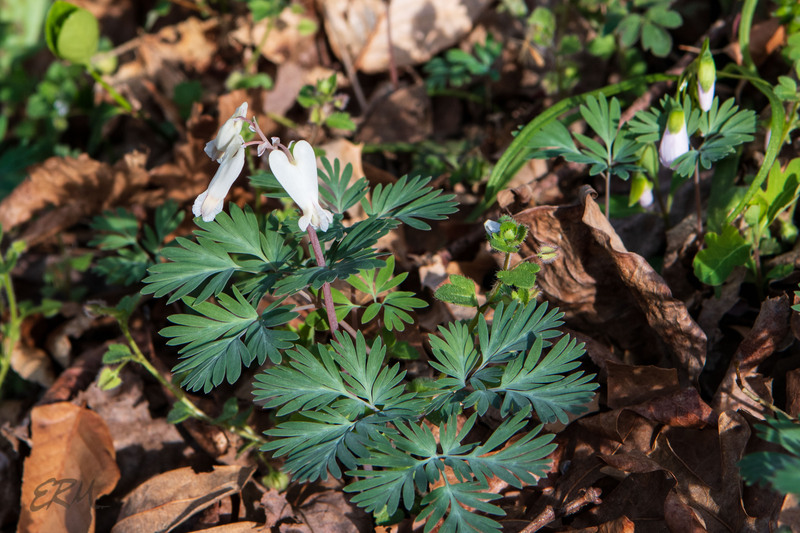 Dutchman’s breeches (Dicentra cucullaria) and the closely-related squirrel corn (D. canadensis; Papaveraceae) are both blooming in moist woodlands. In past years I’ve observed that the latter starts blooming a week or so after the former, so if you want to see both, go hunting soon. Neither lasts for long. 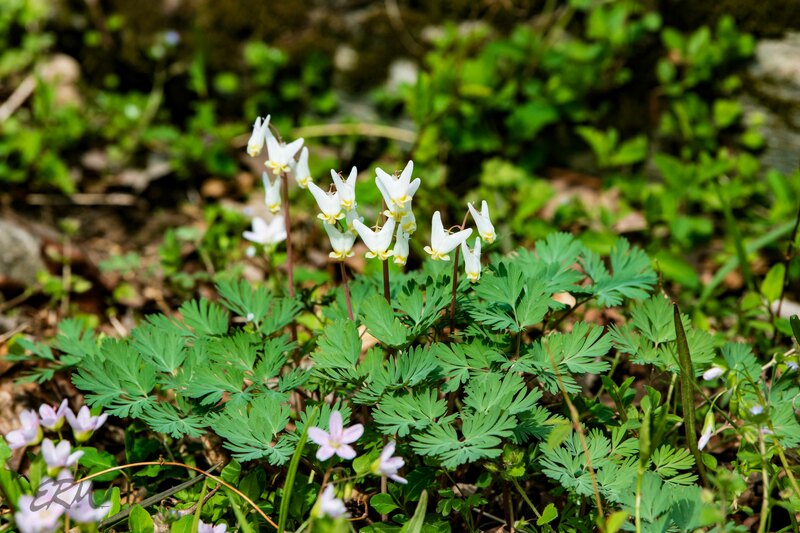 This entry was posted in Uncategorized and tagged Arabidopsis, Billy Goat B, Billy Goat C, Dicentra, Jeffersonia, Mertensia, Micranthes, Phlox, Potomac Gorge, Sanguinaria, Thalictrum by elizabeth. Bookmark the permalink. 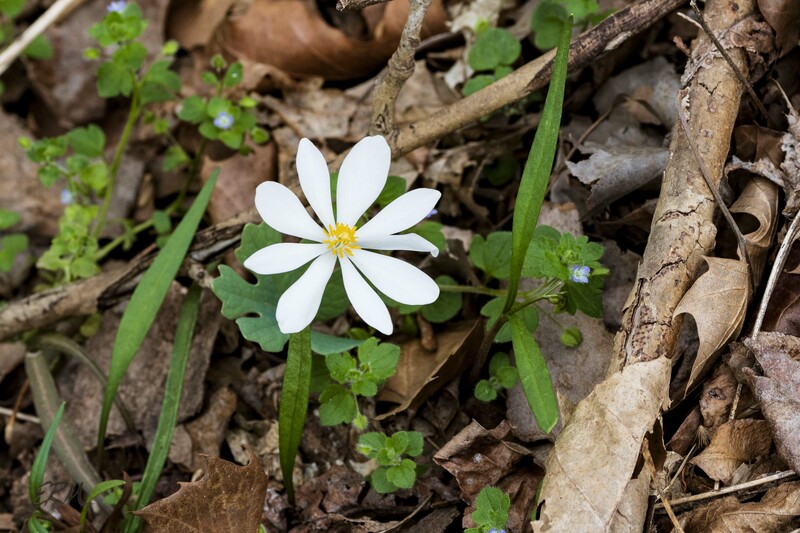 Thank you for the beautiful images of your native plants and for writing about them. I attempt to grow most of the species in my woodland garden in Yorkshire and talk about them to local gardening groups and write about them for the Hardy Plant Society (UK based charity). My D. cucullaria are in flower at the moment and they always amaze me by the way that they ‘pop up’ apparently from nowhere and start flowering and disappear almost as quickly. 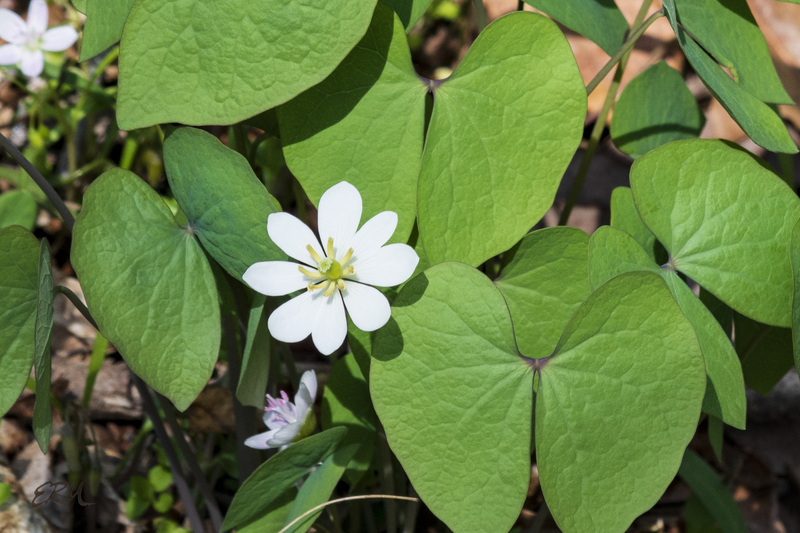 I really like your image of Jeffersonia diphylla that I also grow, but which never looks as pristine as your wild individual, and wonder whether you would allow me to use the image in a talk I am giving on Friday evening in Leeds. I would of course, acknowledge that you hold the copyright to the image. Hi, Peter – thanks for your kind comments. I’d be delighted for you to use any of my images in your talk. Any use that increases appreciation of our flora is fine with me. I’m curious, what other species are you growing in Yorkshire? Are the growing conditions that close to the mid-Atlantic? These native species are difficult to find in cultivation here, so I’m surprised to learn that anyone is growing them in Europe! White is my favorite color, and when I started sharing pictures on Six on Saturday, I often posted six pictures of exclusively white flowers. I even wrote a naughty article about my preference for white. Most of the wildflowers out in sunny locations are brighter colors. The white ones in forested areas must be designed to appeal to the pollinators there. A photographer of wildflowers in Texas commented about how blue flowers often bloom in white as well, more so than flowers of other colors. It sort of makes one wonder if they rely more on ultraviolet or infrared color more than the actual blue, and that they look very similar (in blue or white) to those pollinators who see infrared or ultraviolet.